Our group have talked about social responsibility in class, we were excited about it because we felt that we can build a connection with the community in different levels. my part was about the importance of Voting, and how it can be very important to the community and our social life. 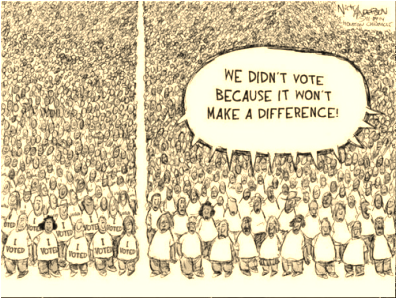 i feel it is everyone of us responsibility to vote and be the difference maker, we all can set aside and blame somebody els for our problem, but we can do something about that. we have a lot of social issues that we are not part of the solution, we can be active to these issues and we will make a big difference. i strongly believe that we need to vote to complete our social responsibility, because if you don't vote you might not be effected, but most likely will effect somebody's els's life by . we might not see the results right away or on the spot, but it will make the difference down the road. in my presentation, i talked about the national debt from wars, health care and education, and these three things will touch everyone of us in a way. we all saw our country lose family members in war, we all need to go to the doctor at one point and most definitely we know some one who goes to school and getting in debt for that. these three things are huge deal for most of us, and we have been suffering the consequences for a long time now.by getting the right people in the system to represent us and talk about our social problem, we can better our lives and the people around us. By voting, we will make the difference and have control of our lives, we will get to a point that we are satisfied with ourselves and we feel that we did our part to the social community, we need to start within to affect people around us. here is my presentation in the link above, please take a minute to review it. i talked about the importance of voting and how it can effect our social life as a family and as a community. also, i showed some statistics about health care system and eduacation, also the cost of war. please forgive me if i was insensitive about anything i posted. ​Asset-Based Community Development is an important step in social responsibility. It develops leadership skills in the community in which it is used, and allows the community to recognize the resources that they already have and utilize it to the best of their abilities. This has the added bonus of not relying on others for help because in many cases help is simply not going to be there. ABC-Development makes the most desperate of the population the focus. These people are usually the most vulnerable to lack of resources, bad social policies, and the victim blaming that typically happens when policy makers try to get involved in communities. The benefits are that it empowers the community members to take charge of their own path and this is how social responsibility is fostered. This empowerment can be sustained without federal funding, builds connections. If we make asset building the center of our policy in our local communities, we can build the social capital that is required to produce our leaders, encourage community involvement and commitment, and improve our sense of social responsibility.